PTL, the leading independent trustee and governance services provider, today announced the results of its fourth quarterly DB Risk Survey. 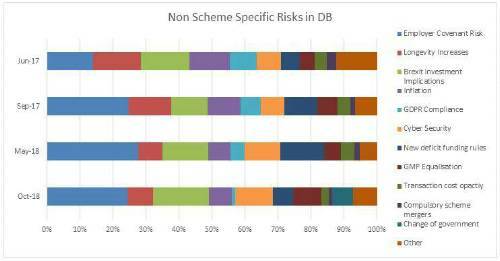 The survey, which has been running since July 2017, asks respondents to indicate the top three risks currently facing DB pension schemes. The full year of results, detailed below, show the aggregate number of votes each risk received as a proportion of all the risks selected. Richard Butcher, Managing Director at PTL, said: “There are a few interesting stories in this quarter’s numbers, especially when viewed in the broader context of the last year. The longevity risk score ticked up a little, but that’s in the context of it already being half what it was a year ago. The indicators that life expectancy is flattening and even reducing could, of course, have a significant impact on DB schemes where, roughly speaking, a one-year increase or decrease in life expectancy can change liability values by 4%.